In many parts of the country, trees and shrubs can be transplanted all year, but no matter where you live, fall is the very best time. The cool air and warm soil temperatures are the perfect combination for establishment. The cooler air is kind to plants and especially to ones that have just lost a major portion of their roots from being dug up. In addition, soil temperatures are still warm, creating an excellent environment for the production of new root growth. Another benefit to fall transplanting is that most plants and trees are entering a period of dormancy. Rather than continuing to transfer energy into new foliage and aboveground growth, plants are now are transferring energy into their roots and storing nutrients and resources for the cool months ahead. By spring, the result should be a well-established root system and a plant that can handle the upcoming demands of summer. Here are a few additional tips to ensure the success of all your fall transplants. When transplanting, always dig a ten-dollar hole for a one-dollar plant. Its not always easy but is always worth it. Make the planting hole two to three times wider than the current root ball but don’t make the hole any deeper than the plant was growing in its previous environment. Contrary to traditional planting methods, the latest research-based data indicates that you should not amend the hole with additional organic material. Plants roots growing in amended soil rarely venture into the harder native soil. The roots become spoiled so to speak and tend to stay only within the modified area. The long-term affect is a smaller root system, reduced growth and a less hardy plant. Instead, simply break up the existing soil, remove the rocks and backfill. 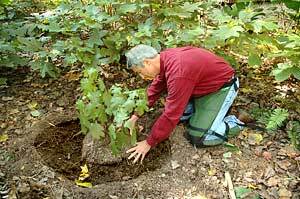 Studies show plant roots simply growing in the native soil actually do better at expanding beyond the original hole. Place transplants in their new environment at or slightly above the surrounding soil level. Newly disturbed soil has a tendency to settle and plants growing below grade can easily succumb to root rot or disease. It is better to plant a tree or shrub slightly high and allow the area to drain than for a plant to sit in a bowl and collect excess water. Next, lightly tamp or hand-pack the soil around the plant roots to ensure good soil to root contact. A critical step at this stage is to water well. Not only does it provide needed moisture but the water helps eliminate air pockets that could otherwise result in dead roots or worse. The final step is to mulch with 3-4 inches of organic matter such as shredded leaves, ground bark or straw. Mulch helps retain moisture and keeps soil temperatures moderate. Winter conditions can be very dry so water throughout the winter if soil conditions become dry. Roots are still growing and soil moisture is essential for proper establishment. The fall season is inspiring and the perfect time to relocate plants you thought about moving over the summer. It’s easier on you and the plants and you’ll be rewarded for your efforts next spring and beyond. The time is now so what are you waiting for? a while back I was able to get your show even though they were reruns now I can not fine where you are or what time you are on, I live in Connecticut always enjoyed your programs learned a lot of things I didn’t know before. Now if you can put on you website the time and days and channel you will air I would love to see your show again. I did enjoy them all. From one gardener to another gardener. Don’t forget to toss a few daffodil bulbs around that newly planted tree – this is the best time of year for them too!